Or why are there so many different kinds? No-one knows who first worked out that you could make fibres strong by putting in a twist to hold them together for making string, thread, rope or other useful things, and none of those early spindles have survived. There are a few from about 2,000 years ago, made from stones or bone or clay that turn up in archealogical digs around the world, and we have pictures on vases and papyrus, but there is little or no evidence of what really early spindles looked like, though they may have resembled those used by many tribespeople today. However those remnants that do survive look very similar to modern ones, regardless of where they come from. After all, a spindle is basically a shaft put through a fly wheel to give it momentum when you twirl it. A quick look through Ebay, Etsy or any spindle-makers website shows an amazing variety of spindles with some very unusual shapes, and some that seem to defy the laws of Physics, or so I have been told - I am no scientist. Most of these are based on ancient designs with a modern twist. The first obviously different ones are the Russian or Turkish-style spindles that generally consist of two shaped pieces of wood set up in an X with a hole through them for the shaft. They are generally bottom whorl, and they have one distinct advantage over regular spindles in that when you wind the spun yarn around the arms of the whorl, the whole lot comes off the shaft in one piece. You then pull out the arms, and you have a ball of yarn. No winding off, which has to be a very good thing. Most modern Russian or Turkish spindles are beautifully made of rare and exotic woods and are things of beauty in their own right, however they can be made from bits of dowel, and the Aboriginal spinners in Central Australia use twigs tied together with string made from their own hand-twisted fibres. Some Australian school spindles only have the one cross piece - I have not yet discovered how they were used. Since scientists and anthropologists now believe that the Australian Aborigines were the first group of people to leave Africa around 70 million years ago, and they lived in social isolation from the rest of the world for nearly all but the last several hundred years, it may well be that this primitive stick spindle is the ancestor of all our modern ones. The next class of strangely shaped spindles are the support spindles, the best known of which is the Russian lace spindle. They have only a slight bump for a whorl, come to a point at the top, and are generally used supported in a bowl of some sort. 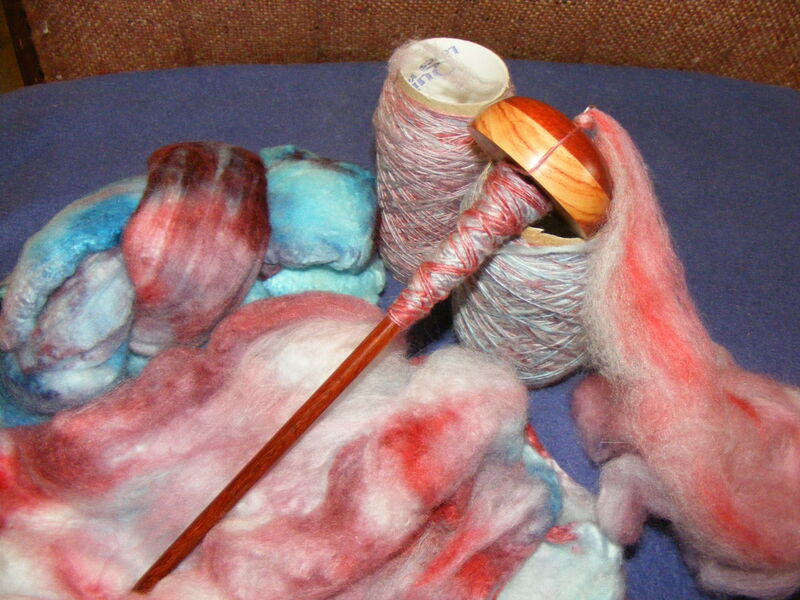 Its possible to spin incredibly fine yarn with these spindles as there is no weight to break it. These spindles are found not only in Russia, but Portugal, France, Eastern Europe and as far afield as the Himalayas. 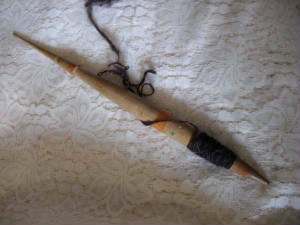 The Tibetan-style spindle is a developement of this style, and the spindles used in Ladahk can be little more than a slightly shaped piece of dowel. While most of these spindles may have been turned on a foot powered lathe, they were also hand carved, and some of the older ones are not truly round by modern standards. Many of these spindles used to be carved or painted, and in some cultures prospective husbands presented a beautifully made spindle to their future brides. The ability to make good quality wooden items was as highly prized as the ability to make fine cloth. Accompanying many of these spindles would be a distaff that the spinner could tuck into her belt. Many have been consigned to the wood heap, but there are still plenty to be found, particularly coming from Eastern Europe and the Baltic countries where the carvings are particularly fine and ornate, and they are now considered collectors pieces. The largest of the specialist spindles is the navajo spindle, with a shaft that can be 36 inches long, depending on whether the spinner sits on the ground or in a chair. 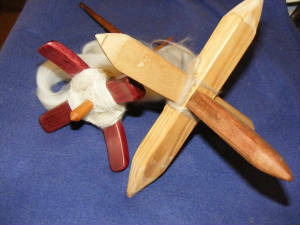 Noel Bennet, in her books on Navajo weaving, describes how they are made and used, as Navajo spinning requires a different technique from those generally used by spindle spinners. The Navajo method of plying has made a resurgence with the popularity of the multi-coloured batts and tops, because it keeps the colour sequences together instead of the barber pole effect of standard two ply. 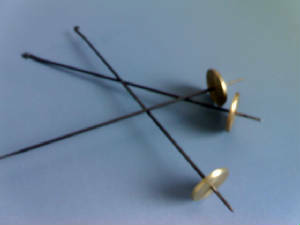 The smallest of the specialist spindles are those used for spinning cotton. These generally have a bead or clay whorl, often very intricately carved, and while some of the clay and beads survive, the shafts rarely do. No collection of specialist spindles would be complete without the Indian tahkli. Made of metal and very light - mine weighs 9 grams - they are very fast and very efficient, and there is nothing quite like them for spinning cotton or very fine yarns. There are plenty of copies of these around, but I would urge anyone who wants one, to find a genuine Indian one. The balance and feel of mine has spoiled me for using any others. 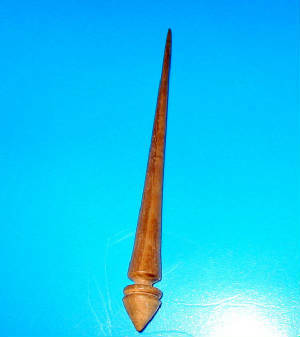 Tahklis are generally bottom whorl spindles used with a dish for support, though they can be used as a drop spindle, where they are as fast as a top whorl spindle. small, light and very fast!